The most common form of bread, for all mountain folks, is the biscuit. Everyone’s day starts with biscuits that are accompanied with a variety of breakfast staples. 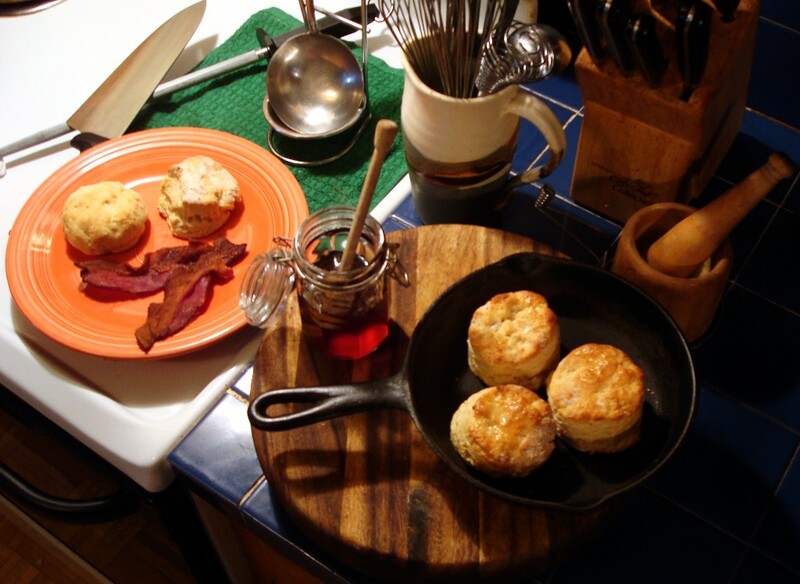 A daily mountain diet is just not complete without a hot homemade biscuit topped with honey or sorghum molasses. Much like any common baked bread, every good cook has their own special way they prepare their signature biscuits. Many guard their recipes as if they were more valuable than gold. Biscuits are a form of “quick bread,” which denotes the fact that baking powder or baking soda is the leavening agent. Southerners are lucky to have Winter wheat as the ingredient for their all-purpose flour. It has less protein than hard Spring wheat used in the northern states. This makes for a lighter, fluffier texture to the biscuit. The basic recipe for a biscuit today is almost identical to the recipes created just before the Civil War. I would be remiss if I did not include the fact that “biscuits and gravy” is a true Southern staple. “Country gravy” or “cream gravy” is basically a Béchamel sauce created from adding cream or milk to a flour roux. Most times the gravy is created in a cast iron skillet with bacon or country sausage added. Obviously a plate of “biscuits and gravy” is a meal in itself. Again, I would be remiss if I did not mention that mountain folks also make a delicacy called “chocolate gravy,” on special occasions. If it’s “better with bacon” then it’s “better with chocolate” too! Mountain folks are funny that way. Here is a reasonably “fool-proof” biscuit recipe. It uses buttermilk, yet another staple of us mountain folks. Combine flour, salt, baking powder, baking soda, and sugar in a large bowl. Using a dough cutter, or a couple of dinner forks, cut [mix] the butter and shortening into the flour mixture until the mixture looks like fine bread crumbs. Add the buttermilk and stir until just combined. The dough will be a little sticky. Turn your dough out on a surface dusted with flour. Dust the top of the dough with additional flour. Now fold your dough over on itself about 6 or 7 times. Gently flatten dough with your hands until it is about 1 inch thick. Cut your biscuits with your favorite cutter. They should be about 2 inches across. Combine the dough scraps and hand-form your final biscuits. Lather them with butter and honey, …enjoy! This entry was posted in Folklore, Necessities, Recipe, Tools, Traditions and tagged Baking, Baking powder, Béchamel sauce, Biscuit, biscuits and gravy, Boston Mountains, Bread, cast iron skillet, chocolate gravy, country gravy, cream gravy, Flour, Gravy, sorghum molasses. Bookmark the permalink. Seconds, please . . .